All applicants need to show evidence that they have participated in Professional Development in some substantive way. If you have engaged in little to no Professional Development, you will apply via the Academic Professional Development (APD) stream but if you have previously engaged in and implemented Professional Development, then you should apply via the Reflection on Experience (REx) stream. 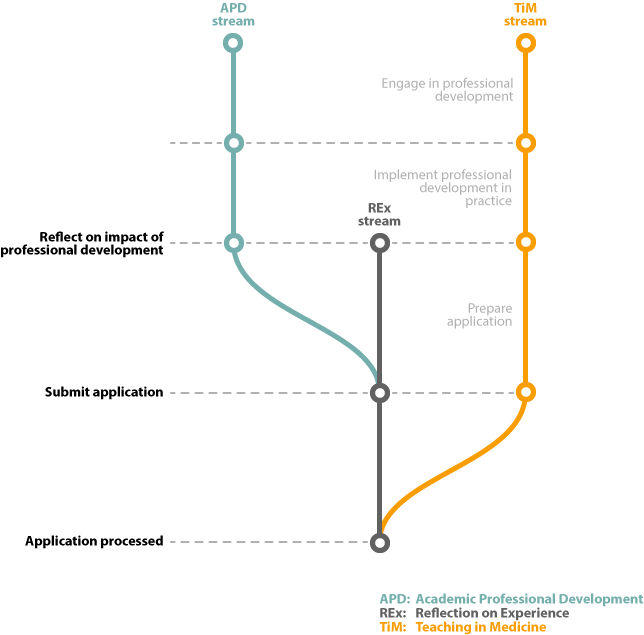 As shown in the flowchart below, once you have engaged in Professional Development and implemented it in practice, the APD stream converges with the REx stream where you will reflect on the impact of your professional development in the preparation of your HEA fellowship application. Alternatively if you are a clinical or medical educator, you will go through the Teaching in Medicine (TiM) stream which involves a different process facilitated by the ANU medical school and Canberra Region Medical Education Council (CRMEC). It’s not enough to have just engaged in Professional Development, you must apply it to your own approaches to teaching and supporting learning AND reflect on what you have learnt through this process. Sometimes you may not be gaining any particularly new insight but it might reinforce your existing teaching practices. For example, you might discover through Professional Development that there are established frameworks for what you are already doing in practice and that is great as it further validates your work! In short, we want you to engage, apply and reflect on your Professional Development so that you can build a strong HEA fellowship application. The Academic Professional Development (APD) stream is designed for staff who have not completed relevant Professional Development. This highly scaffolded pathway will support your application by providing both mentoring and active professional development at the same time, flexibly delivered to meet your needs. Please attend an Information Session (E1) to discuss this further with an EFS mentor. The Reflection on Experience (REx) stream is designed for staff who already have significant levels of experience in teaching and learning (this may include research supervision) AND who have completed Professional Development related to teaching and learning. Please attend an Information Session (E1) to discuss this further with an EFS mentor. The Teaching in Medicine (TiM) stream is designed for clinical and other medical educators, and is available in a Professional Development context through the ANU Medical School and the modules run by the Canberra Region Medical Education Council (CRMEC). Please email efs@anu.edu.au if you think this applies to you and an EFS mentor will be in touch to provide more information. Once you have decided which stream to take, work out which fellowship category best suits you, and then continue to prepare your application.